Our full range of chalk boards are an excellent way of advertising food, opening hours and company names inside and outside your venue. 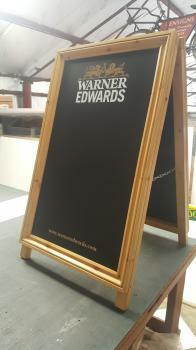 We can provide individual chalk boards, or a full set for inside and outside your premises. Our full range of chalk boards come blank or with permanent text that can be written to your own requirements. We can also personalise the board surrounds to include your own logo (see table top chalkboards below).